We have many leagues to play competitively or just for fun. Join sanctioned groups to play with other members closer to your skill level. Select a group that suits you and show up at the courts at the designated time to meet the group Captain.members of the group and try it out. Leagues are competitive play. You can join as many leagues as you like. Leagues keep scores and rank players on a ladder. Please pay your dues to join! Sanctioned groups can be joined at any time. Select a group that is closest to your skill level. Sanctioned groups are fun! Find a group that suits you, go to the courts at the designated time to meet the Group Captain and members and to try it out. Mixed Doubles play where intermediate partners stay together during all matches. Sign up at CC bulletin board weekly. HT Members Only. Lessons (Beginner/Intermediate/Advanced) are available winter season: November thru March. Signup sheets posted on Wednesday, 9 AM at Town Center. Check Town Center court bulletin board for details. HTPC Membership required for all except Beginner lessons; HT residency required for Beginner lessons. Beginner to Advanced Pickleball Lessons. Sign up at TC courts starting Weds at 9AM. Men's play for recommended level 3.5/4.0. Show up at Court. HT Members Only. Must be Men 75 years or older. All skill levels welcome. HT Members Only. Every Tuesday & Thursday weekly. MEN, Skill level 4.0 and up, AGGRESSIVE PLAY. Show up at courts. HT Members Only . Recommended play is at a 4.0 level or better. At least one member of each team must be a member; a partner may be a non-member (11/16/10). Sign-up with Captain. Recommended play is at a 4.0 level or better. At least one member of each team must be a member; a partner may be a non-member (11/16/10).Sign-up with Captain. Must play at least at 4.5 level. Members of the group will entertain players that want to see if they can play at that level. HT Members Only. Couples who want to play at the recreation level, just for fun. Partners switch after each game. Sign up with captain on Bulletin Board. HT Members Only . Mixed doubles for recreational play where you change partners each game. This play is for all skill levels who want to play for fun and to practice skills from lessons earlier that day. Show up at courts. HT Members Only. All Happy Trails Pickleball Club members and their overnight adult guests. Round Robin play for Intermediate and Advanced players. Focused, competitive play. Every Sunday, Monday, Tuesday, Wednesday, Thursday, Friday & Saturday weekly. Every Sunday, Monday, Tuesday, Wednesday, Thursday & Friday weekly. All Happy Trails Pickleball Club members and their overnight adult guests. 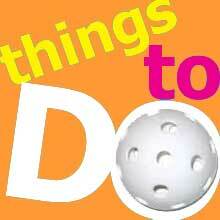 Round Robin play for Recreational, Novice and Beginner players. Play for fun. Open to women with 3.0 level of play. Show up at courts. HT Members Only. Women of 3.5 skill level; have mastered 3.0 skills and are proactively developing 3.5 skills. See USAPA Self Evaluation sheet for skill definitions. HT members only. Recommended level of play is 4.0 or better. Show up at courts. HT Members Only. This event is for ladies 70 and older. All levels of play are eligible. Show up at courts. HT Members only. Women for Beginners, Novice, and Recreational play. Open to all HT Residents. Membership in the Pickleball Club is encouraged for Beginners and required for all others. Beginners, Novice, and Recreation. Open to all HT Residents. Membership in the Pickleball Club is encouraged.